1. In March, Olympic dressage rider Courtney King-Dye suffered serious brain trauma after a horse she was schooling stumbled and fell. She remained in a coma for a month and has been on the long road to recovery ever since. King-Dye’s accident reignited the ongoing debate over helmet usage in dressage and has led to some positive change. 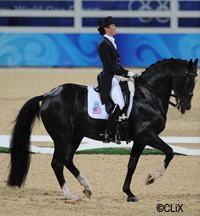 During 2010, several top-level dressage and eventing riders have been sporting helmets in the schooling arenas and even while competing. The sports’ governing bodies are also considering making changes that would require more riders to compete in helmets. 2. Planning for the 2012 Olympics in London is underway, and in March, Greenwich Park was officially announced as the venue for the equestrian events. Preservationists and residents near the park protested, but the decision appears to be definite. 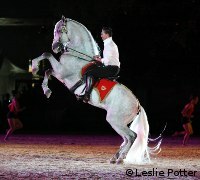 During 2011, dressage, show jumping and event riders will be working to qualify to ride at Greenwich Park in 2012. 3. 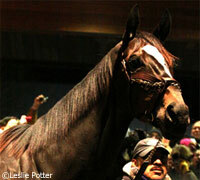 The great racehorse Zenyatta broke the record for most consecutive wins by winning her 17th race in June. She then broke her own record two more times, maintaining a perfect record until an upset at the 2010 Breeders Cup Classic. In spite of that single second place finish, Zenyatta’s fans still celebrated her career with enthusiasm when she was retired in December. 4. American Horse Publications released the results of the largest survey of horse owners and managers ever completed. According to the results, nearly three-quarters of horse owners use their horses for recreation and dressage is the second most popular use. The surplus of so-called unwanted horses was chosen as the top issue facing the horse industry. The survey also revealed that most owners are paying more to keep horses than they did two years ago, but 70% said they would be willing to cut costs in other parts of their lives in order to keep their horses. See more of the survey results here. 5. Although it did not get much publicity in the United States, the inaugural Youth Olympic Games took place in August in Singapore. While the sole equestrian event, show jumping, was won by Marcelo Chirico of Uruguay, the big news was bronze medalist Dalma Rushdi H Malhas. This young rider was the first female athlete in any sport to represent Saudi Arabia in an Olympic event. In Saudi Arabia, women are generally prohibited from competing in international sports, but this young equestrienne has helped to begin to break down that barrier for girls in her country. 6. No round-up of 2010 equestrian news would be complete without a mention of the Alltech FEI World Equestrian Games. For the first time in WEG history, the greatest equine athletes and riders, drivers and vaulters came to the United States to compete in the world championships of eight equestrian sports. Although there was some skepticism about how well such an event would do on American soil, especially during a recession, but at the end of the 16 days of competition, the organizers and participants were ready to declare it a success. The next WEG will be back in Europe, but thanks to the success of 2010’s edition in Kentucky, we may see future WEGs in North America again soon. An article with all this packed in is very nice. Espeially because it’s all there. Thank you. I didn’t remember that Courtney King-Dye’s accident was this year. It seems longer ago than that! Good recap of the year. Thanks and Happy New Year to the whole team! ZENYATTA FOR HORSE OF THE YEAR!